Is Safflower Seed Oil Safe During Pregnancy? Nerium oleander is a small evergreen tree native to Southeast Asia, northern Africa and the eastern region of the Mediterranean basin. Traditionally, Nerium oleander extract has been used as a medicinal supplement to treat ulcers, leprosy and hemorrhoids and induce abortion in pregnant women. There is no scientific evidence suggesting that such uses of Nerium oleander are safe or effective. In fact, even in small doses, Nerium oleander is extremely toxic and is deemed unsafe for use by anyone. Extracts derived from the leaves and seeds of the Nerium oleander plant contain substances called glycosides. Glycosides can have severe toxic effects on the body, including the heart and other vital organs. Ingesting any type of Nerium oleander extract or the raw plant itself can cause oleander poisoning. The initial symptoms of Nerium oleander toxicity typically arise within a few hours after consuming this plant. Onset symptoms include nausea, vomiting, diminished appetite, bloody diarrhea, drowsiness, dizziness or dilated pupils. Handling Nerium oleander may also cause skin irritation, such as redness or itching. Without immediate medical care, these initial symptoms may cause serious health complications. Nerium oleander toxicity can be deadly and may cause loss of consciousness, seizures, heart rate irregularities and severely low blood pressure. You may also stop breathing or develop heart block, a potentially fatal complication in which the electrical signal responsible for telling your heart muscle when to contract is blocked. Contact an emergency medical provider immediately if you ingest Nerium oleander to ensure you receive appropriate and prompt medical attention. While in the emergency room, a doctor may administer activated charcoal in conjunction with intravenous fluids to absorb and flush this toxic substance out of your body. In addition, she may perform gastric lavage, a treatment that involves placing a tube through your mouth into your stomach. Your doctor can then wash any remaining Nerium oleander out of your stomach by using the tube. If you are experiencing breathing or heart problems due to Nerium oleander toxicity, your doctor may also provide breathing support or may monitor your heart function by performing an electrocardiogram. 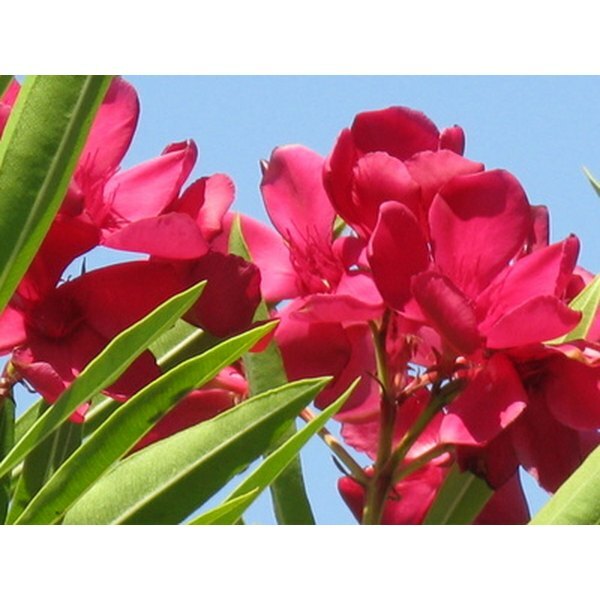 If available, your doctor may also administer an antidote to reverse the toxic effects of oleander. What Is a Man's Daily Requirement in Grams of Iron Intake?